We're very happy to welcome you there. The posts and comments are moved. and after that we'll close this site. Please think about taking a graphic to our new site at your sidebar. You can download one at the new site. Look at the bottom of the new site for the graphics, or unger "graphics" in the tagcloud. Lots of thanks for all those who helped to create attention for Gomey, so he wouldn't disappear in anonimity, like so many autistic people who are victim of "the system". More than 80.000 people clicked the graphic, which was displayed on a countless number of blogs. Bloggers blogged about Gomey. People reacted on Twitter and professionals did what they had to do. So a huge "THANK YOU" to all of you for taking a stand for Gomey. A human rights lawyer, Julius Grey, got involved and he called the hospital. Gomey's mother also spoke to an ombudsman (a woman) of the hospital, and she mentioned to know that the lawyer had been in contact with the hospital. During a visit to hospital the woman asked to speak to Gomey privately. She asked him whether he wanted to go home or to an english speaking hospital. (It turned out that the judge has made a request to transfer him to an english speaking hospital, but the french one was reluctant to let him go there. Ofcourse Gomey wanted to go home and eventually he was able to do so. At home he was very insecure. He kept asking if they would come again to get him. His feeling of safety has been shaken in such a bad way that he wants to move out of town and out of Quebec. He would welcome a move out of Canada. The fact that he wants to leave his wellknown life makes clear how much his life is shaken by what has happened. His feeling of living somewhere secure and stable has gone. Any help to get the family a new place to live will be appreciated. Because the winter took it's time this year, Gomey has been able to ski again. And he has played scrabble again. He's trying hard to find a balance and to deal with his bad memories. Gomey is one of many autistic people who are victim of the lack of knowledge of people about autism. As soon as authorities only listen to those who hide their lack of knowledge behind a professional image people become a victim and are traumatized. Mistakes can not be completely undone, Especially not, because there are no laws that grant therapy after mistakes, even though some professions, like psychologists, have ethical guidelines to undo harm that is done. Like Gomey, many people all over the world live in constant fear to be taken from their homes just because they are autistic. Unless we are able to create more understanding and acceptance for the uniqueness of each and every human being, and unless we're able to make it impossible for professionals who make these terrible mistakes to work ever in the area of psychology and psychiatry again, Gomey will be a symbol for all these misunderstood beautiful people. It has been 2 weeks since I've talked to you or seen you. I wasn't able to warn you a head of time that I would be stolen out of my home. I was numb the whole way to the hospital. My fear is consuming me. I told mom, that I have to share with you what happened to me. Because we are so close. We share so many wonderful moments together. And I'm looking for comfort from you, in these darkest days of my life. I know in my heart, that you suffer every minute knowing I am here. Where I am, is the worst place to be. I can not sleep at night, from all the screams, yells and the laughing of the nurses late at night. With out any consideration for the people that are here. After all we are in the "coco nest"
Nothing I am doing is good enough for him. His name is Eugene and he doesn't seem to like me very much, and it is making my life here very difficult. And yesterday the educator by the name of Pierre, disturbed me by trying to touch my belly button. You know how much I don't like to be touched by strangers, and especially in stressful situation like this one. There is also an educator that comes in the evening, his name is Marcelle, I hope he will be here all day every day. Because he's really nice to me. For the last 10 days, no body came to see or talk to me, from the medical staff, in regards to the court order for an evaluation. Why did they ask for 21 days if they are not doing anything? I'm extremely sad, confused and upset, that I can not get a definite answer from mom, of when I'll be free. In the last 13 days, I haven't been outside, not even once, Nofar. But the time doesn't pass, Nofar. I told mom a few times, that I'm disturbed by the food choices. They don't give me another choice, but Milk as beverage, beef, or pork. I offered that I would eat a sandwich with Jam, instead of meat, but they refused. I also asked them for Bread with Jam for a snack, and they also refused. Since I came here there hasn't been one day with out severe stomach pain and other pain in various areas of my body, but they ignored my situation. Chantal (from the case management) promised my mom that I can go every day with supervision to play basketball, in 13 days I've only gone once for a half an hour. Why don't they take me outside, nofar? and I asked mom, to let you know, about my condition and what I'm going through. So you can talk with the ombudsman and let them know, some of the details. I would like you, Nofar, to be my voice and speak on my behalf. Because they took my rights away and with that my voice. I'm completely isolated with out any human contact. Nofar, How long will it take until I can hug you and mom again? I decided to write you because I knew that you would do everything and anything to help me. I love you and miss you and I hope that soon we can do all the fun stuff that we do, together. For Gomey and his family daily life, dealing with the challenges of autism, has changed into nightmare. Lack of knowledge by others often disrupts the relative wellbeing of autism families, and here too this is the case. Gomey and his family worked hard to learn to deal with specific autism issues. Now he's 19 he's a so called high functioning autist. On wednesday january 27 Gomey and his mother received a message he would have to leave his home and within 2 hours 6 policemen and several social workers came and took Gomey out of his secure environment and brougth him to a psychiatric hospital in Montreal called "Hôpital Rivière-Des-Prairies". The young man, who has never slept a night outside his home, was brought from the familair, english speaking, environment into a complete strange situation without any preparation whatsoever. Added to his, for autism characteristic, impairment of cummunications skills a language barrier, because the hospital is french oriented. He does speak some words in French, but not enough to feel comfortable... if that would be possible under those circumstances. Why he was brought to a hospital where french is the language of communication in a town where also a hospital is available where english is spoken is a big question. At february 1 Gomey finally could hug his family. The days before familymembers were not allowed to visit or call him, information about his wellbeing was withheld. Gomey himself doesn't know why he has to be there. He feels imprissoned. He has lost everything he had. He wants to go home with his mother, far away from the screaming he hears often during the day. And all due to one person who doesn't understand autism. She's a social worker who took over the yearly ritual of a short assessment of the family to reach an agreement about some hours of respite care. She just started 4 months ago and after speaking with Gomey for not even an hour she decided she knew it all and put the whole train of breaking up a happy family in motion. She took matters in her own hands, probably without even consulting the professionals who know Gomey well and who never saw any reason to doubt Gomey, his family and his living conditions. The court order said that Gomey is is a danger to himself, to others, and even suicidal. Something which is not recognised by anyone who knows Gomey. And even more important: the doctor in the hospital that he is currently staying at informed the family that he doesn't self mutilate and is no danger to others or to himself. Yet, on february 2nd, the court decided Gomey should stay at the hospital 21 more days. Those who started and kept this mistake in motion want him to move to a group home. All against the wishes of Gomey and his family, who want him home, who want him to develop himself at his own pace and to his own abilities. Like other autistic people all over the world. 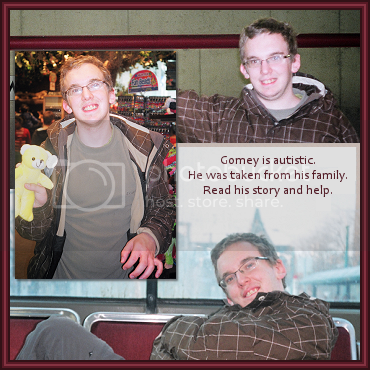 Gomey was a nice young autistic boy who went to school with an aid provided by the board of education. He's still going to school a few times a week, because he's unable to go to college with his peers, and because he's eager to learn. (Taking him away from school also means he's not going to school). Gomey plays clarinet, guitar and piano. When he feels happy he sings. He's learning Spanish because he loves languages too. He doesn't have close friends, which is a characteristic of many autistic people, but he's engaging in social activities with his family nevertheless. They go on hikes, they love traveling to Europe when they can afford it, and his mom taught him to ski. He was delighted that this winter enabled him to ski a few times and he was looking forward to do so a few more times. Which won't be possible now he has to stay behind locked doors for so many weeks. 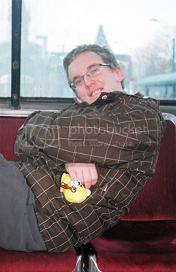 Gomey loves looking at old pictures, especially of his visits to amusement parks with the subway and street cars. But even those pictures are not with him, and there's certainly no one to share his memories with. And he can't replay scenes of the amusement parks or create new games with his brother. Something they both enjoy. Gomey is important to his family members, they love him and he loves them. Why the new social worker drew the damaging conclusion from meeting Gomey for not even an hour is the main question. Even psychiatrists and psychologists take more time to access suicidal risk. People who know Gomey question themselves how someone can decide he's a risk for his environment. In all those 19 years he has never harmed someone, never attacked someone. Gomey was recognised for his hand flapping. Many autistic children display some sort of repetitive movement. Especially in times of stress or overstimulation. Gomey learned to listen better to himself and as he grew up he learned to recognise difficult situations and often he's able to deal with them, sometimes with and sometimes without help. There's no reason whatsoever to state Gomey is automutilising (physically harming himself). Gomey has been seen by doctors for a metabolic disorder. He has been hospitalised for weight loss and he's now treated under medical supervision from a special clinic in Seattle with a special diet. His mom was taught how to prepare Gomey's food and she is strict om keeping him on this diet. Especially after Gomey reported he felt stronger and far better. That his mother keeps him on this diet might have been part of the reason the social worker decided Gomey need to leave his home and family. The family lives in Sainte-Adele in Quebec, a small town. Before the family lived in Toronto, where they had easy access to services which are not available in the small town. The family is afraid that now the hospital has assessed that Gomey isn't automutilating and is no harm to himself or others, the attention will shift to his mother and the diet. Because Gomey's metabolic disorder is rare the diet is rare too. Even though the social worker is no doctor and no dietician, she has come to the conclusion that this diet (low oxalate diet, see http://www.ohf.org is not of benefit for Gomey. Maybe she didn't understand that his loss of weight wasn't due to the diet and he was seen by the best of doctors. Maybe she doesn't know that quite a lot of autistic young people have problems with either eatinghabits or weightissues, and that little is know about this correlation. Maybe because Gomey's mom didn't agree with Gomey participating in a work program at a time he needed his energy for other things, she has decided his mother is not cooperative enough. Maybe she has decided that Gomey's mother harms her son with a diet that can't be of harm when the proper supplements are provided, Like Gomey's mom does. Gomey's family doesn't know why this social worker acted the way she did. Before Gomey was taken from his home by a policeforce and several social workers he was happy and told his family he felt happier than ever before. The family needs a lot of answers and Gomey needs to be free to go where he wants. He's 19 and didn't commit any crime, so there's no reason at all for a 6 headed policecorps to take him from his home without his consent. We need the story of Gomey spread to those who can take action. We need lawyers to look in his case, because his rights were violated. We need psychologists and psychiatrists who dare to speak out on behalf of this family. and professionals who want to work directly with the family to support them and solve the matter. Anyone who can contribute from his or her profession is welcome. Why was Gomey taken from his home? Why did they come with so many people? He is 19, so the law allows him to make a well informed choice. Why where his rights violated? The family wants to cooperate in any way to solve this matter. Copy this graphic or the code and put it on your blog to draw attention to this story. Inform me about the url. Write about Gomey and autism. Let me know your url, so I can mention it here. Inform your local papers and write/mail to those in de Montreal area. Ask me for a press release, in case you need one. Inform any of the media. and follow ActionAutism or Laanetweets to keep updated. Send a card to Gomey and his family to show your care and support. Others will notice these cards too and know that this family is watched. Maybe they'll take better care. Rock the world so Gomey will be set free. Gomey is just one of the many autistic young people who are either thrown behind bars or put in institutions, just because people don't understand the true nature of autism. Gomey's family are an example of many families who have to deal with professionals who make daily life a hell, because "they know better". Many parents fear interference of Childcare and other organisations because they take care of their children in a way which is not like society takes care of normal children. Link to updates can be found at the top and here. Autism is a neurological disorder which can't be cured, but can improve when the environment is able to adjust to the needs of the person. Because of a lack of differential diagnoses many children are considered autistic and won't receive proper support and therapy, whereas they show autistiform behaviour which can be influenced with proper treatment of the underlying physical condition. We've had a very long meeting today about the workload we're experiencing at the moment. Many people suffer the effects of the cutbacks on sevices for autistic children. We've spoken about the DSM V plans to move Asperger syndrome within the complete autism spectrum. In some countries people are afraid they won't get special aid anymore, whereas in other countries people welcome the change because aid comes available. We've talked through all what we needed to discuss about the new site. Most important was the introduction of a triage system for emails and other mail. The changes also require a different approach to volunteers within the organisation. We decided we need someone who looks into the volunteer costs. In some countries volunteers get nothing and in other countries it's possible to pay them back their costs. We don't have sponsors, do we need them, want them? In the closing round we discussed some online issues. At last The Lancet took action. No link between vaccines and autism. It was absolutely clear for scientists that vaccines don't cause autism. Simply because the rise of autism in countries where no vaccines are given to children mimicks the rise of autism in countries where vaccines are given, when careful, standardised diagnoses are made. The whole way Wakefield and his team conducted the research was not up to the quality (and quantity) standards of proper research. And... which is as important... the results couldn't be replicated. It was interesting to see over the years that in countries where medical opinions are by law the privilege of people who are qualified to make medical judgements, people didn't belief in a relationship between vaccines and autism. And in countries where everyone can spread his or her opinion about everything without having to take responsibility rumours were soon labeled "the truth", and people who knew how to play the media were called "experts". I bet many of those "experts" earned a nice amount of money with appearing on TV and selling stories and alternative therapies. By the way they targetted me when I spoke out against a link between vaccines and autism from the first moment on after I saw Wakefield's research, I knew that a lot more than believing the wrong prophet was at stake. The way that for instance Jenny McCarty waved even the undisputable statements of The Lancet away was a clear illustration of how people can stick to their wrong assumptions. And it's a pity that people just follow her blindly, instead of questioning themselves why on earth they hand themselves and their opinions over to someone who is in confict with doctors and scientists all the time. Persistence is an honorable characteristic, but knowing when to change your mind and opinion in the light of overpowering evidence is at least as honorable. But maybe I'm just lucky to have seen the signs and signals of autism in my 4 boys way before their vaccinations. And maybe I'm lucky to accept that we don't know everything, and that nature is a strong force and we know just only part of what it does and how it works. Science began with simple questions: why does something happen, how does it happen? And from these simple questions people struggled to create a system to draw conclusions and to describe how reliable they are. They used a lot of common sense in that they wanted to be able to get the same results when the same methods to find them were used. Every day experience taught that when something occured once it wasn't a guarantee it would happen again, and that when events occured in a certain order that didn't mean the first event caused the second. So they tried to control events to see what happened. Research isn't a backyard game for those who like to see what they want. Research is subject to lots of rules and requirements which have emerged in a long process. This guarantees carefullness and limits the amount of mistakes, but it also limits the rate of development. And all the time scientists have to describe what they do, because others should be able to get the same results under the same conditions. Science doesn't create make-belief, but it does describe and recreate reality in such a way that others will be able to get the same results and won't see what's not there. I know there are parents who keep saying that vaccines caused autism in their child. They subject their (other) children to preventable health risk by not vaccinating. Their children will call them to responsibility later in life. But why would they stick to drawing conclusions from two events that took place in the life of their children? Is it to flee from the rotten feeling that maybe genetics plays a role and that we, moms, conceived without knowing we would cause autism in our children? Is it to forget what we ate, because maybe a cause will be in our food? Or is it to push away the chilling fear that we might have seen the signs and signals of autism in our children earlier, so our child would have has better support? It's for all of us as individual persons to answer to the questions life poses. One of the main questions is: do we have enough knowledge to draw certain conclusions and do we want to take responsibility for what we tell others? And do we have the guts to change our minds when we need to? At least and at last the Lancet took action. It should have happened a lot earlier. We need your help to bring a very pressing problem straight into the limelight in such a way that no-one can deny the problem. Lots of autistic children are prescribed medication which helps them in a way, but which also causes uncontrollable weight gain up to a pound per week. I need to hear from parents whose autistic child is using abilify. Please display this banner on your site to reach out. Parents can contact me by using the contact button at the top of this site. Please use: "Abilify and weight" in the subjectline so I'll catch your mail at once. My computer crashed so replies will be delayed. People with autism and/or autism spectrum syndrome (called autism here) should be enabled to develop themselves fully. Families should have full access to all support they need. Autism expresses itself in different levels of seriousness at all levels of society. Understanding ends misconceptions and negative behaviour. Knowledge is the basis for positive acceptance. Every autistic person should have his or her own place in society. Enable individuals with autism to participate in society they way they want. Motivate the development of new programmes, visions and laws according to the needs of people with autism and their families. Promote and provide information, knowledge about new scientific developments, treatments and ways to deal with autism. Create awareness of misconceptions, mistakes, lack of professionalism, ignorance and negligence. Stand up against people who mislead the public. 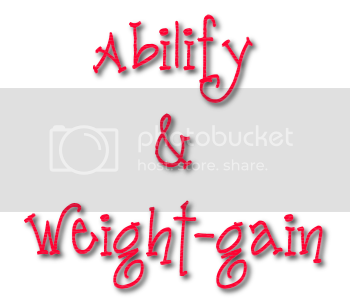 New images will display automatically. and upload it to your own blog. That means you're not allowed to copy, or multiply in any way, the content of this site, or parts of it, for your own, public or other use, unless you have written permission of the author. This site is created in The Netherlands, a full member of the Berne Convention and the WIPO.